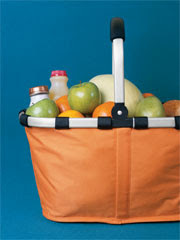 Meet the Collapsible Basket. I know I've posted repeatedly about reusable grocery bags, but this one really is my new favorite. Use it for when you forgot to buy those last few ingredients on your last market trip (ie: vanilla for the cookies or the pesto for the pasta and/or whole milk for your toddler (! ), all things I did just last week). It's got a lightweight aluminum frame and a super cushiony handle. Built to hold up to 55 pounds. Double it up as a picnic basket and bask in the seasonal change from summer to fall. My favorite part is the variety of prints and colors it comes in!. totally cool! I like that it has a "skeleton"..I've been using my HUGE IKEA bag...it's big and all but sometime I need a little more structure! thank you! I got the basket in red at Marshalls for only $10! I put it aside my daughter's carseat to keep her books and toys and etc. very useful indeed. I saw these at the Container Store last weekend, too. They look great, and I love how they can fold up flat.